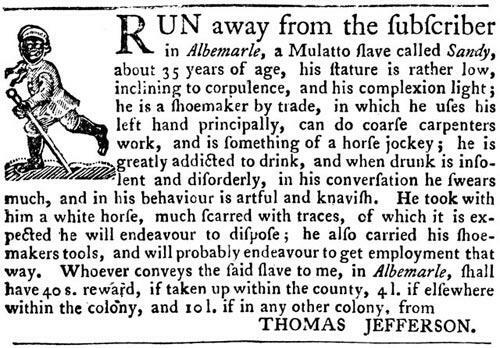 Thomas Jefferson slavery history: His newspaper ad for a fugitive for his plantation. The Virginia Gazette, Williamsburg, September 14, 1769. Virginia Historical Society / Library of Congress. Seven years before writing that “all men are created equal” in the Declaration of Independence, Thomas Jefferson ran this ad in the Virginia Gazette, offering a reward for his runaway slave, Sandy. He describes Sandy as “artful and knavish” and “greatly addicted to drink”. At the time, Jefferson possessed upwards of 50 slaves, inherited from his father, although he would come to own hundreds over the course of his lifetime. Jefferson eventually reclaimed Sandy, who he sold for 100 pounds several years later—a common fate of slaves deemed “troublesome”. Jefferson’s views on slavery were complicated, to put it mildly. On the one hand, he made several prominent stands for antislavery causes over the course of his lifetime, especially during his early career. In 1784, for instance, Jefferson put forward a provision that sought to prohibit slavery in all new states carved from the territories. This amendment to that year’s Ordinance would have effectively blocked the westward expansion of slavery. It failed to pass by a single vote. *Correction, Oct. 1, 2014: This post originally misstated that every enslaved person on Washington’s plantation was manumitted upon his death. Washington left instructions that the slaves he owned be emancipated upon his wife’s death. Oher people enslaved at Mt. Vernon were subject to different rules of ownership, and Washington could not have left directions as to their fates.